It's a baby boy! Let the world know with this 'Baby Boy Clothes Line' Baby Shower Bunting, featuring matte paper flags printed with baby clothes, dots, and chevron print on both sides. You can even make two baby shower banners from this kit: simply cut the included ribbon to your desired lengths and string through the flag banners. Assembly required. It's a baby boy! 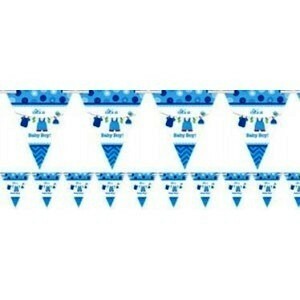 Let the world know with this 'Baby Boy Clothes Line' Baby Shower Bunting, featuring matte paper flags printed with baby clothes, dots, and chevron print on both sides. You can even make two baby shower banners from this kit: simply cut the included ribbon to your desired lengths and string through the flag banners. Assembly required. Flag Banner product details: 4.5m (15ft) when assembled 24 Pennants, 1.8m x 2.1m (6'' x 7'') each.